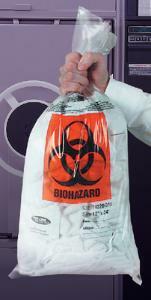 Autoclave bags provide an efficient, safe solution for the messy and potentially dangerous process of disposing of biohazardous waste material. High-strength, highly temperature-resistant polypropylene construction allows perfect adaptability to standard laboratory disposal routines, including steam autoclaving. Ordering information: Twist ties included.